When it comes to cross-cultural simulation games, Barnga is an oldie but a goody. Barnga was created by Sivasailam “Thiagi” Thiagarajan in 1980, while working for USAID in Gbarnga, Liberia. During a coup, his team’s vehicles were commandeered by the military, so Thiagarajan and his colleagues stayed in their compound, passing the time playing Euchre. Born in Chennai, India, Thiagarajan had moved to Bloomington, Indiana, where he’d learned how to play the card game, and as his Liberian coworkers hadn’t played it before, he gave them a copy of Hoyles Games to read up on the rules. The trouble was, after their crash course, they all came away with different interpretations of how to play. Rather than clear up the arguments, Thiagarajan let the players work it out, and after three hours, the group had settled on their own, unique version of Euchre. From this, Thiagarajan developed Barnga, one of 120 simulations and games that he has created during his career. The concept of Barnga is simple (Spoiler Alert! 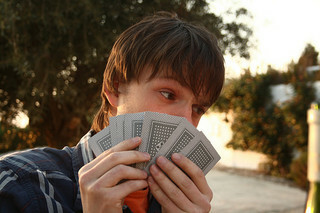 ): players are given rules for a card game called “Five Tricks.” Unknown by the players, though, is that each set of rules is slightly different. When participants begin playing, the results are many and varied: confusion, accusations of cheating, frustration, assertions of authority, feelings of isolation, resignation, competitiveness, formation of alliances, etc. The instructions for Barnga not only include how-tos for the simulation but also guidelines for directing the follow-up discussion—wherein lies the real meat of the experience. It’s when people discuss how they feel about the game, and about each other, that the shift is made to the realm of cultural interaction. Barnga works best with about 20 to 40 players, though it is possible with fewer than eight. Instructions—in four languages—are available from several sources, including Thiagarajan’s website, The Thiagi Group, and Amazon, where several pages describing the game are available with the “Look Inside!” feature. And if Barnga whets your appetite for group activities, take a look at Thiagarajan’s list of over 300 free “training games and activities,” most of which also appeared in the Thiagi GameLetter. Looking for a game to play with family and friends? Here’s one you might like. I’ll call it simply The World Proverbs Game. I came up with the idea several years ago after playing a version of Balderdash, just using a dictionary. (As you probably know, Balderdash is a board game in which players try to come up with believable sounding definitions for obscure words.) Similar to Balderdash, there’s a game called Wise and Otherwise that requires players to complete proverbs that come from around the world. I found out about it after I’d already bought a book of world proverbs and made up my own rules. Honest. First, you need an encyclopedia of proverbs. There are several out there, but the one I got is Wolfgang Mieder’s Prentice-Hall Encyclopedia of World Proverbs. It says it’s “the largest compilation of its kind,” and I won’t argue with that claim, since it includes 18,520 sayings from all over the globe (that’s a big increase over Wise and Otherwise). The proverbs are arranged by topic, and each one is followed by the place from which it comes. As I write this, I see there are a couple used copies at Amazon for under $3.00. Next, cut up some scratch paper and gather up some pencils. That’s it. You’re ready. The rules are simple: One person in the group (you need three or more players) looks through the encyclopedia and chooses a proverb. He then reads it to the other players, leaving out one or several words. For example, he might read, “Nine out of ten matchmakers are BLANK.” Then everyone writes down the full phrase, filling in the blank with a word or phrase of his choosing. Each player takes a turn being the reader. To save time, the person next in line should vote first and then make her own selection from the encyclopedia while the others are voting. Play continues until someone reaches 100 points (or that can be higher or lower, depending on how long you want the game to last). It’s fun to see how people with different personalities play the game. Some people are very logical. Some people would rather go for laughs. Some are experts at bluffing. Some, not so much. And some people can’t keep a straight face when they read the false proverbs, no matter how hard they try. You are currently browsing entries tagged with games at Clearing Customs.